Have you played any variation of the Forehead Game before? It doesn’t actually always involve your forehead – the popular icebreaker has each player wear the word they have to guess on their back. The point of the game being that each person has to guess what their card says, the catch being everyone else knows except the person with the card. It’s an awesome indoor game for kids (and adults). Two of my family’s favorite games are Hedbanz (a board game) and Heads Up (an app). Because we love these games so much, we blew through the cards/clues that came with them long ago. Luckily, it’s pretty easy to make your own forehead game at home so you don’t have to wait for someone else to create bonus sets. Today I’m going to show you how to make your own forehead game. I’ll also explain how different forehead games are played so you can choose the way that is the most fun for your family. While the gameplay for Hedbanz and Heads Up is slightly different, the one thing these forehead games both have in common is clue cards. These are the words that the players have to guess based on the clues provided by the other players who can see them. Both games also use timers. Any kind of timer will work – a kitchen timer, a timer from another game, a timer app on your phone. To make your own clue cards, you have a lot of options. If you have index cards or sticky notes laying around, you can simply write your own clues on them. If you want sturdier cards, you can use playing cards and glue pictures onto them. I like to print my own cards on white cardstock. If you don’t mind using the same cards multiple times, you can even laminate them with clear contact paper or a small laminator (they’re less expensive than you’d expect). 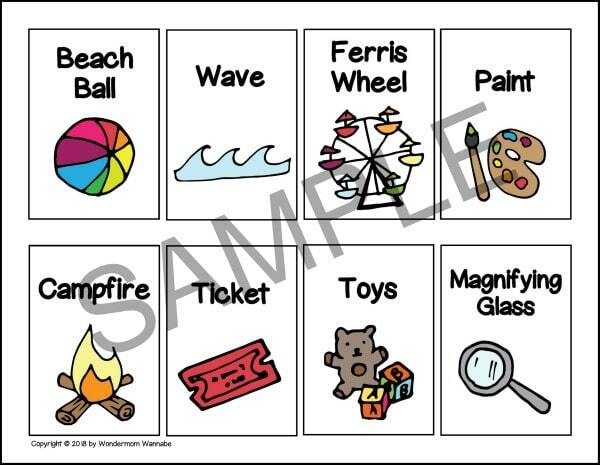 I created a template in Word for the cards and just add images (for younger kids) and words. Feel free to download the Printable Forehead Game Cards and template for your personal use. Just click the image below to access the file. Want more cards? You can buy the full set of 120 cards I’ve created. The complete set comes with instructions for three different games you can play with the cards (headband game, memory, and 20 questions). To play the board game Hedbanz, players each wear a headband and slide a card in the slot on the front. This allows the other players to see the card while also ensuring the person wearing the card can NOT see it. To achieve this in your homemade game, you just need a way to hold the clue cards on each player’s forehead. Since we have four females in our home, we had a ready supply of elastic headbands on hand so that’s what we use. If you’re making your own game that you intend to use often for family game nights, consider a set like this one so each family member can have their own designated color. I’m a big fan of color coding my family. You can also make a simple construction paper headband like we all did in preschool or kindergarten to be Indians at Thanksgiving. Glue two strips of paper together to form one long strip. Wrap the strip around your head, starting centered on your forehead. Staple together where the pieces overlap at the back of your head. Cut off the excess paper. Then, just stick a paper clip in each headband in the middle of each player’s forehead to hold the clue cards. Place the cards face down in the middle of the playing area. Have each player place a headband on his or her head. Each player takes one card and WITHOUT LOOKING at the printed side, places the card in the center of his or her headband with the printed side visible to others. Youngest player goes first and play passes to the left. On your turn, start the timer and ask the other players “yes” or “no” questions to help you figure out what item is on your forehead. Ask each player one question, starting with the person on your left. When you’ve asked each other player one question, you may start again as long as the timer hasn’t run out. At any time that you think you know what the card is, you may ask “Am I …. ?” and if the answer is no, you may continue asking questions. If you guess your card before the timer runs out, you may take another card and try to guess it before the timer runs out. To play without a timer, limit the number of questions each player can ask other players. If they cannot guess the card within that number of questions, their turn ends. When players guess their card correctly before the timer (or number of questions) runs out, they get to keep the card as a point. The first winner to have three cards/points wins. The “official” game has 60-second rounds but you can make your rounds however short or long you want, as long as they are the same for both players/teams. Heads Up is a two-player game. If you have more players, you can simply divide into two teams. Have each player sit opposite each other with the cards face down between them. Decide who will go first (we always play rock-paper-scissors to determine). On your turn, start the timer. Pick up a card without looking at it and hold it to your forehead so the other player can see it. He or she must give you clues to help you figure out what item is on the card. When you guess a card correctly, set it on your left. If you want to pass, set it on your right. Anytime you set a card down, pick up a new one until the timer runs out. When the timer runs out, the second player takes his or her turn following the same guidelines above. At the end of the second player’s turn, each player counts the number of cards in the pile on their left. The player with the most cards wins. If you want, you can play until one player reaches a certain score (e.g. 25 points). I hope you have as much fun playing these forehead games as my family does! They are such fun and easy games, that just happen to improve deductive reasoning and communication skills at the same time. The cards are a great deal for $4.99 and We love this game at our house!